There are numerous facets to the legal duty of care that medical professionals in New York, including surgeons, must provide to their patients. They must listen attentively while their patients describe their symptoms to ensure that they have all relevant information when determining a diagnosis. They must follow best practices in their field when providing a diagnosis, having considered multiple possible diagnoses before reaching a conclusion. And before any invasive procedures can begin, the doctor must obtain the patient’s informed consent to the procedure. In a recent New York Appellate Division case, a patient filed a claim against his doctor alleging that he was not provided with all relevant information on the risks involved in undergoing a procedure. Read on to learn more about the case and about a New York doctor’s legal duty to provide informed consent. The recent case, titled Alessi v. Mucciolo, was filed by a patient and his wife against his doctor. The patient claimed that he was not properly informed of the risks involved in undergoing a vasectomy, and that he would not have undergone the procedure had he realized the risks it entailed. At trial, the doctor argued that he had fully explained the risks involved in the procedure before conducting it. The jury ruled in favor of the doctor, and the patient appealed this decision. In other words, the patient is claiming that the doctor either didn’t get their permission whatsoever before performing a procedure, or, while describing the procedure, the doctor did not properly explain the risks of complications or side effects from the procedure before getting the patient’s permission to perform it. The patient also has to prove that they wouldn’t have undergone the procedure if the doctor had properly explained the procedure. In the case of the patient in Alessi, the Appellate Division concluded that he had received the information he deserved to consent to the procedure, and dismissed his claim for lack of informed consent. Lack of informed consent claims are not usually filed alone. Typically, they’re filed alongside other claims for damages by patients who are injured after undergoing a medical treatment or procedure. 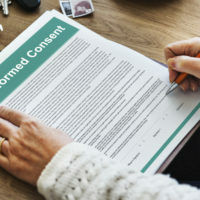 There are limited occasions where doctors aren’t required to obtain informed consent before conducting a procedure, such as in the event of an emergency, or if the patient is unconscious or otherwise unable to provide consent. However, New York patients are almost always entitled to learn all relevant information on what harm they could suffer if a procedure goes wrong, and what alternatives are available for medical treatment to address their condition. If you’ve been injured by a dangerous medical procedure or believe that you have a claim for lack of informed consent in New York, get skilled legal advice on whether you should file a personal injury lawsuit by contacting the knowledgeable and effective Manhattan personal injury lawyer Leandros A. Vrionedes for a no-cost consultation, at 212-889-9362, or in Queens at 718-777-5895.